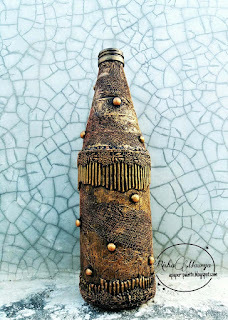 Paper Palette: GDT post at Rainbow Craftykari-Altered Bottle!! GDT post at Rainbow Craftykari-Altered Bottle!! Hope you had a crafty weekend. I am very pleased to inform you guys that I have been recruited in Guest Designer Team of Rainbow Craftykari. I want to thank Maninder Kaur for giving me this great opportunity to teach and learn from fellow crafters. 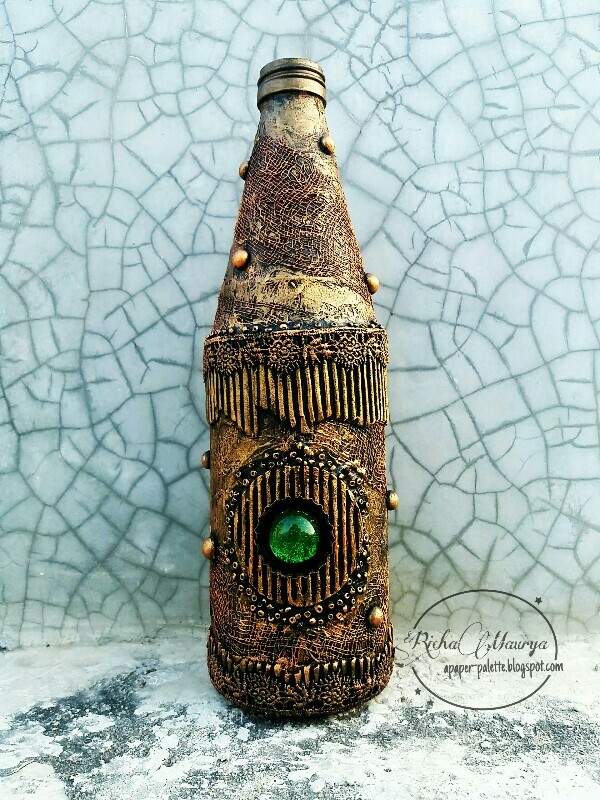 For my first post as GDT I have created a Mixed Media Alteration of old bottle to an Antique Beauty. Here are a few snaps. To know how I created this piece hop on to My Tutorial Post at Rainbow Craftykari Blog. And don't forget to participate in Rainbow Craftykari's first monthly challenge," Revamp your Scraps" to win some exciting prizes, here is the link to the challenge post. Thank you for dropping by. And do leave some love if you liked my work. Amazing bottle ! perfect colors and texture... 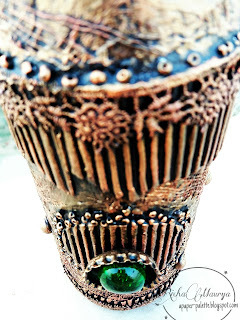 Thank you for your participation at Sandee & Amelie steampunk challenge. 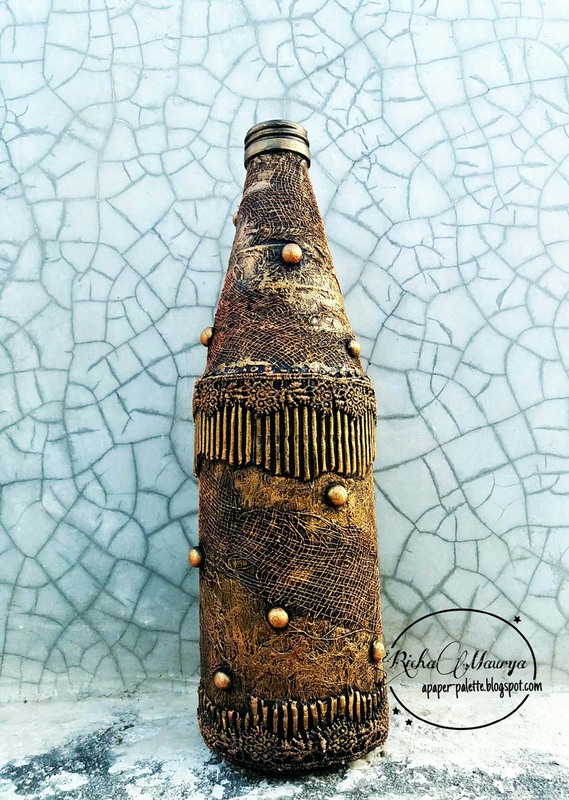 The textures are so effective on your altered bottle. Thank you for joining in at Rhedd's Creative Spirit Challenge this month. absolutely amazing and a statement piece love it. Thank you for sharing with us over at Rhedd's Creative Spirit this month and hope to see you again in future challenges. Thank you Ellapu...Really motivating coming from you.. Awesome! One of the best altered bottles I have seen in a long time! Love it to bits! Thank you for sharing it with us at SASCPC! Lovely work. 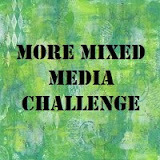 Thank you for joining the challenge at More Mixed Media and Not Just Cards. Hope to see you again next time. Wow this is gorgeous! Thanks so much for joining us at We Love to Create! First of all, congrats on your GDT spot! What a fantsastic peace of art you have turned this bottle in to! Really love it! 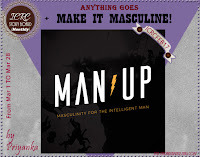 Thank you for joining our challenge at Scrap From Your Heart! 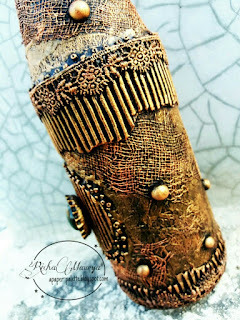 Congratulations, and what a fabulous altered bottle! Gorgeous! Thanks for joining us at Creative Artiste Challenge. Gorgeous altered bottle, love the textures!!! You have achieved amazing textures on this bottle. I love the details and the design! Very nicely done. 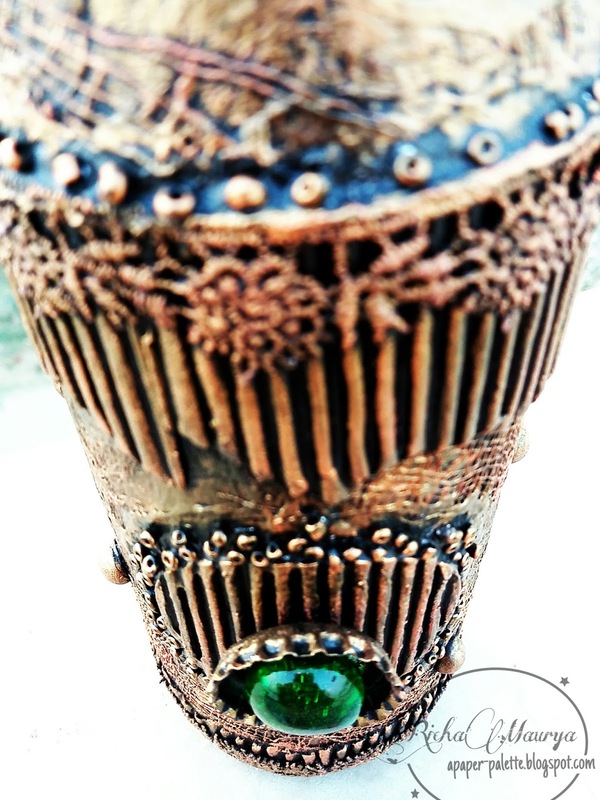 Thanks for sharing with us here at Altered Eclectics! 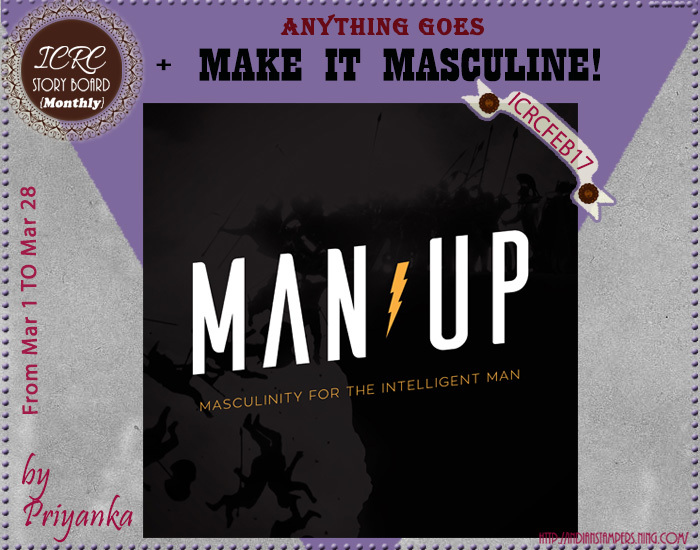 Congrats on your GD Post Richa! Love this bottle, texture is amazing! Thanks for sharing with us at Indian Craft Room! Good Luck! Thank you for leaving comments...They mean the world to me.. If I get lucky and you decide to follow me..do leave your blog link so that I can follow you back. Happy Crafting. Hello ! I am very passionate about crafting. 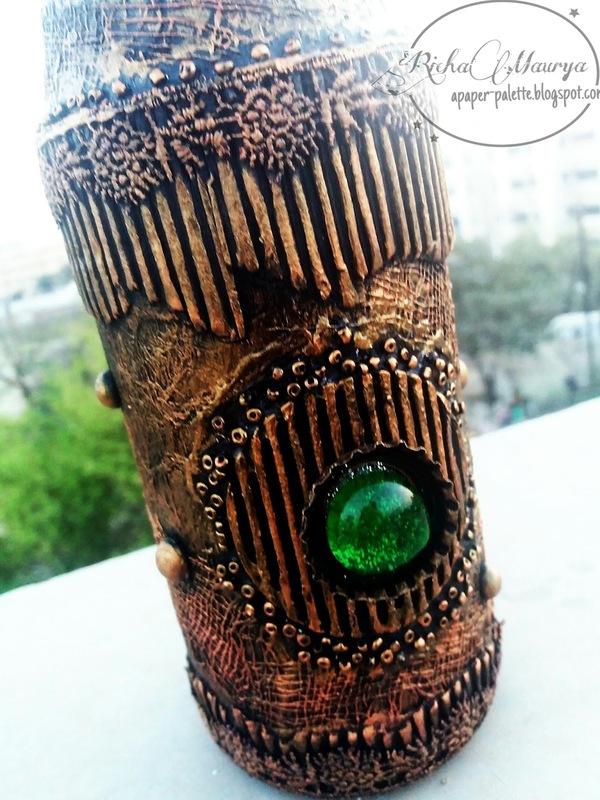 I am a doctor by profession and a quiller/crafter by passion.I have created this blog to share my craft work.Hope you like it.Thanks For visiting.